Make wishes in a designer style along with this magnificent colorful Thali in Meenakari style with size variance between 8-9 Inches. 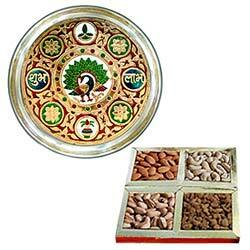 Assorted Dry Fruits will add extra flavor to the celebrating mood. the weight of Assorted Fruits 500 gms.